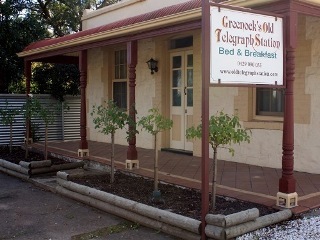 Located in the World Famous Barossa Valley, Greenock’s Old Telegraph Station Bed & Breakfast is a great choice of accommodation for lovers of history, nature and culture. Our charming cottage once served as one of the original telegraph stations linking Adelaide and Angaston operating from 1866, at a time when travellers stopped over in the area on the way to the Murray River. Our accommodation offers two beautifully appointed bedrooms catering for up to 5 people, features new reverse cycle air conditioning, cosy living room with wood combustion fire for cool nights, and a modern country-style kitchen with all necessary cutleries, crockery, and cooking utensils, including coffee machine. Our lovingly restored property features an outdoor BBQ and entertaining area, and a fully enclosed backyard area. The Barossa is renowned the world over for its premium wines and traditional foods. It is a place of scenic beauty with church spires reaching to the sky, gentle undulating hills, natural landscapes and historical buildings, a place that attracts people from all over the globe. Come and take a step back in time, follow the Historical Walk of Greenock, see its many original buildings, enjoy a meal at the local Greenock Creek Tavern, or visit the nearby famous Murray Street Vineyard and our neighbours at the Barossa Brewing Company. The accommodation consists of one queen room and one double room, sofa bed, offering a catered maximum for 5 adults, well appointed living room with slow combustion fire for those cool winter nights, modern country-style kitchen with all necessary cutlery, crockery and cooking utensils. 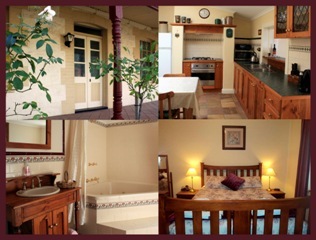 The large bathroom features a lovely 2 person spa bath, perfect for that romantic getaway to the tranquil Barossa Valley. All linen, towels and bathrobes are supplied for each guest for use during their stay. Along with its old-world charm Greenock's Old Telegraph Station features some well blended modern comforts including Free Wireless Internet to help you keep in touch with family and friends whilst on holiday should you so wish, a 32” flat screen LCD television with a selection of DVDs, air conditioning, electric blankets on both beds for those cool Barossan evenings, washing machine and an outdoor BBQ, for those relaxing warm summer evenings in the Barossa Valley. To make you stay all the more complete, guests receive a complimentary bottle of locally produced Barossa wine, some locally produced port and chocolates and generous provisions for breakfast.